We all learn to look at screen texts from an early age, just as we learn to listen to the stories that our parents read to us. However, just as we need to be taught to read and write in order to become literate in the traditional sense, so we also need to be taught to 'read and write' audiovisual texts in order to become literate citizens of a 21st century democratic world. In this section you will find two check-lists that are designed to help teachers and students learn how to analyse and discuss the meaning of audio-visual texts whether factual or fictional. Together with the punctuation and grammar guides presented on other areas of this site they should help demonstrate to any doubters that screenworks are not just 'illustrated' written texts, but complex interwoven time-based narratives that deploy a highly evolved language of their own - and are therefore worthy of detailed study. The key thing to remember when analysing any audio-visual text is that like all texts it is a deliberate act of creation. The film may be a documentary that seeks to depict reality or use a realistic style, but there are still many choices made by the filmmakers relating to editing, shot length, types of shot, use of imagery and music that effect how we relate emotionally and intellectually to the texts. The act of close-reading audio-visual texts involves becoming aware of – and being able to compare and analyse – these choices or systems of working, just as one judges the style, technique, imagery (and bias) of a journalist or author. A good place to start with any film is to ask: What type of text is it?What does the title suggest it is about? Who was it made for? How was it funded or commissioned? And how was it filmed? Type of audiovisual text - Factual films come in a variety of different forms: news, documentary, corporate film, advert (often closer to fiction than reality), 'reality' TV show (often closer to fiction than reality), public information film, propaganda film, local topical film (see feature resource), wedding video, home movie, etc. Production - Identify how the film was funded, by whom, the reason it was made, how it was produced, and for which audience. There is a great deal of information you should be able to discern from the titles and credit sequences at the beginning and the end of the film, but you may also find out more with some basic internet research. When it comes to factual film it helps to discuss issues relating to how the filmmakers gained access to the settings being filmed? To what degree they needed to gain the co-operation of the participants in making or coordinating the film? How well funded the production looks to be? How many cameras they are likely to have used (this is very important as documentary or news footage can be edited together to make it appear to be happening at the same time when it is not)? And how open and upfront the film-makers are (or are not) about their methods and techniques? Narrative structure - Fictional films (and observational documentaries) usually focus on the desires, actions, challenges and obstacles facing one character (occasionally several) as they struggle to achieve a goal. Factual and documentary films are often organised around simple rhetorical questions that often will reveal its true narrative genre. If the question is a investigation the structure of the narrative is likely to be detective (e.g. news and current affairs docs), if it is historical it may employ the structure of a thriller or an epic, if it is a future doc it will often follow a horror format e.g. documentaries about how the country might respond to a pandemic. It is vital you identify how the film is structure and what the concerns of the film and its genre are likely to be. Active Questions - What rhetorical or narrative questions does the audience want answered by the film? If there is more than one question, how are these ordered, e.g. in a whodunnit we first need to find out who has been killed, then who did it, then whether they will be caught and finally why they did it. In a documentary the film will usually set a main rhetorical question at the beginning and several other sub-questions as the narrative unfolds. It may also raise narrative questions connected to specific characters shown in the film. Genre – The genre to the film gives us our biggest clues as to what the narrative will be about – sometimes known as the theme. Specific genres have specific general themes, for instance a romance is about love, a horror film is about survival and a rites of passage or communal drama are about the desire for validation. This goes for factual films as well as fictional ones. For instance , investigative documentaries are by definition investigative thrillers and therefore always about justice and/or morality. That said you will need to look closer than the general theme that the genre gives you to work out what the narrative is truly about, e.g. 'Titanic' shows that true love triumphs even over death. Documentary is supposed to be truthful as well as informative. It is the reader’s job to ensure that s/he can distinguish between fact and opinion, detect any bias in a film, and examine how the filming may have had an impact on what was filmed. That said factual films are rarely simply documents in themselves as where the early topical films or YouTube style single shot videos. Most of them use editing techniques to create meaning from a series of images, scenes and narration. Subject Matter – Where is it set and what is it about? This is particularly when looking at archival film where the world have changed considerably since the film was made. In this case what is most interesting about the film may not be what it was meant to show, but elements of the scene that the filmmakers may take for granted or have gained or decreased in significance to the audience through time. Rhetorical questions - Look at the different questions raised by the film, examine their order and use this to analyse how the filmmakers build and expand upon their initial arguments. Many arguments proceed along dialectical lines. This means the filmmakers present a thesis, then show conflicting views and then try to resolve the differences between these two or more points of view. Narrative sequences - Identify the different sequences and the different documentary techniques they employ, e.g. ‘Voice of God’ narration, observational sections (either using continuity style cuts and/or long-tracking or panning shots that reveal the presence of the cameraman) or not presenter led discussion, interviews, talking head interviewees with illustrative cutaways or GVs (general views that are often used to underscore or reinforce the theme or context of the narrative). Surprise - Identify the main surprises and turning points in the narrative, how are these used to influence the argument and engage the audience emotionally and intellectually. Authority and trust - Examine how the filmmakers encourage the audience to trust in their ability to examine the argument fully. This may be achieved by having a well-known voice narrate a ‘voice of God’ narration or having a well-known presenter appear in the film to lend credibility. Likewise the film may interview a range of experts whose names and titles appear on screen. Or it may be produced by a particular broadcaster, producer or director who has a reputation to preserve. Truth - Look closely to see whether the filmmakers are even-handed and fair. Are there times when their shooting or editing techniques favour one side or the other? In some cases the film may be deliberately one-sided and polemical, but if this is the case the filmmakers should be upfront about their intentions. Drama documentary, staging and historical re-enactments - Where films use these devices you will need to examine closely the issue of accuracy. The dramatic reconstructions may have been written or approved by historians but where this is not clear you may need to look closely at the historical record to see how much really is known about what exactly happened and where the filmmakers have ‘filled in the gaps’. Statistics - If the film uses statistics, examine whether they explain their method or whether they expect you to take their statistical gathering and analytical techniques at face value. Remember the quote attributed to former British PM Benjamin Disraeli and popularised by the novelist Mark Twain, “There are three kinds of lies: lies, damned lies, and statistics." If people don’t explain their statistics, you will need to discuss how far they can be trusted, based upon your knowledge about who made the film. The presence of the camera - Examine whether the presence of the camera or the technical requirements of filming would have changed the nature of the events being filmed and ether this might compromise the integrity of the film. It is important to know a bit about film history in order to analyse archive film texts. In the early days of filmmaking which began in around 1895, films were made by professional companies and distributed to be screened as part of an entertainment or novelty programme at the travelling shows or music halls. The equipment was often supplied by a company, for example, Edison’s cinematograph – the conditions of which meant that a showman could only show films made by the Edison company. Film from 1895 – 1910 was very much something that was brought to the masses and which they could have no influence or impact on or in. Viewers of early films were very much consumers of this latest entertainment product or invention. From 1910 the first purpose built cinemas emerged and cinema going developed. 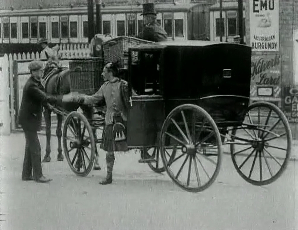 Films were still supplied by professional organisations and companies for entertainment and news. It was not until the mid-1920s that the first ‘home movie’ cameras became available for people to make their own films. These early ‘home movie’ cameras and film stock were incredibly expensive and therefore purchased by the wealthy who had both the money for the new equipment, but also the leisure time to use it. Developments in technology in the 1930s meant that several home movie cameras and film stock were available for the amateur filmmaker. However, it was not until after the war that amateur filmmaking became less expensive and available to a wider section of society. Since the 1950s new formats have been introduced with technology becoming cheaper and more easily accessible over the last 50 years, so that today everyone has access to some kind of filmmaking equipment, whether it is a digital camera, Flip Video camera or mobile phone. Today, everyone and anyone can make their own film. Where was it screened and who saw it? Professional film or home movie? Establish this by looking at the credits. If there are no credits – try and establish the date of the film by what you see on screen. Is it an event or occasion? 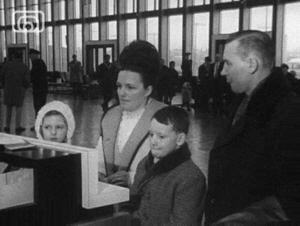 Where was it, try to find out when that occasion or event took place by researching in the local library or online. 1895 - mid 1920s – If the film was made before around 1923 it is highly likely that it will have been have been made by a professional company. Amateur filmmaking equipment was not available before 1923. 1923 – 1940s – Developments in technology meant that various types of film camera were developed for use by amateur filmmakers. 1923 Standard 8mm film cameras and stock were introduced by Eastman Kodak. Kodak also introduced 16mm film for the amateur filmmaker. Also dating from this time was Pathe’s 9.5mm film cameras and projectors, which were also used widely for both making films and screening studio films. All these formats used black and white film. In 1936 Kodak brought out the first successful colour film for the amateur filmmaker – Kodachrome – it was very expensive in the lead up to the war and only those with money had access to it. During this time, many cine clubs and film societies made their own dramas and films largely using 16mm black and white film stock. 1940s – 1950s – Film stocks during the war were rationed and ‘home movies’, especially colour films were rarely made. Following the war, both 8mm and 16mm film was relatively cheap for the amateur and many ‘home movies’ or amateur films were made during this time. 1965 – Super 8mm film came onto the market and quickly replaced Standard 8mm as the quality was better. 1980s – Today The development of video cameras and now digital video has made amateur filmmaking accessible to all. 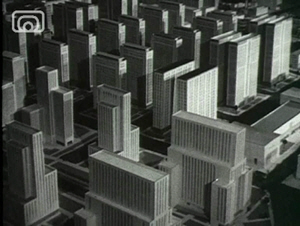 Fictional screen narratives feature large in culture. While there are few fictional films in this collection, there are frequent dramtised sections of documentary or sponsored films in this collection. There may also be sections of a film where the filmmaker is suggesting that a narrative exists by editing together disparate shots to create the illusion of continuous and connected action. Characters - Who are the main characters and how are they introduced to us? How do we discover what they want and what they fear (NB. Here you should look out closely for the use of POV shots in establishing desire)? If there are no characters, what is the subject? Genre - Does the narrative have a defined genre? What are the key elements that allow you to point to a specific genre? Tone - Is it a comedy and if so, what type of comedy, and how do you know what type it is? e.g. slapstick, farce, comic romance, romantic comedy, thriller comedy, satire, black comedy, tragicomedy, etc. NB. If it is not a comedy, the narrative may still have comic moments or comic interludes and it will be worth noting how these are used and whether the tone is consistent throughout. Initiating events - What are the initiating events in the character's story? NB. These may not be the same as the initiating events in the story world. e.g. the reasons a soldier joins a war are often not the same reasons that his country goes to war since they may or may not be connected. Suspense / dramatic irony - Who do we with sympathise with and why? Why do we pity them and fear for them? On deeper level you might also want to think about historical ironies, cinematic and genre ironies as well as these dramatic ironies. Task - What do the characters have to do to get what they want? What would happen if they failed? Opposition - Who stands in their way? Why do they oppose the main character? NB. In a disaster movie this is not necessarily a living creature. Strengths and weaknesses - What are the main characters strengths and weakness (physical, mental and sociological)? How are these tested during the story? How do opponent(s) attack their weaknesses? Stages of conflict - What are the main stages of the conflict? How does each stage challenge a different aspect of the character? Reversals and revelations - What are the main reversals of fortune (from good to bad and vice versa) and revelations during the narrative? How do these help propel the narrative forward? Recognition - What are the key moments when the audience realises the character will need to make greater efforts to achieve their goals? Climax - What is the climactic moment of the film and how does this satisfy the big questions the audience has been asking about the characters? Resolution - Is the conflict resolved in a surprising, interesting and emotionally engaging fashion? Aftermath - How has the world been changed by the action and conflict we have witnessed? Shots - are any types of shot used more frequently than others? How are they used? How often are they used? Are there any used in judicious moments for special effect? What is that effect? Angles - Is there any system to the use of lenses and angles? Cuts - Are any types of cut (on any of the layers) used more frequently than others? What effect does this help produce? Are any used? Composition, colour, etc. - Are there any specific compositional techniques, colour schemes, lighting systems or references to art-history that are being used to influence the audience? Setting - What is the setting for the film both in terms of the general setting and specific use of locations (or choice not to use them)? You may also want to think about the time in which something is set or how different times or how different eras are established (in period films), compared or contrasted e.g. in epics or documentaries. Imagery, colour and symbolism - Do the filmmakers choose to use any images, symbols, colours situations that are particularly distinctive on their own or which repeat and create a pattern of meaning? What affect do these uses have? How do these uses relate to external sets of symbols? Music – Is there any particular style or pattern to the music? Is it generally diegetic or non-diegetic? Is there anything significant in the choice or timbre of the chosen instruments or use orchestration? Is the music's use appropriate to the subject matter or used for contrast or juxtaposition? In a factual film you may ask whether use of music is appropriate or whether it carries too much bias? Is it themed in any way to event, character, setting, etc.? How is it used to support the other narrative layers of the film?